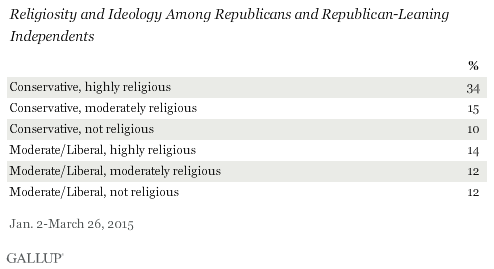 How Many Highly Religious Conservative Republicans Are There? Texas Sen. Ted Cruz chose a conservative, evangelical Christian university as the setting for his announcement that he was running for president. This underscored his apparent strategic decision to focus relentlessly on the conservative, highly religious segment of his party, both in terms of attempting to become their candidate of preference, and also in terms of maximizing their turnout in the 2016 primary elections. Many other Republicans, as noted, lean in either the conservative or highly religious direction. For example, 26% of Republicans are not highly religious but are conservative, while another 14% of Republicans are highly religious but not conservative. Together, these segments represent another big chunk of the Republican universe -- about 40%. It will remain to be seen how much appeal Cruz or one of the other more conservative and religious GOP candidates might have to highly religious Republicans who are moderate or liberal ideologically, or to conservatives who are either moderately or not at all religious. Although Barack Obama won't be running in the 2016 election, Republican candidates will clearly use him as a symbol of what they are running against, particularly as manifested in his eponymous healthcare act. Overall, few Republicans approve of Obama's job performance, but within the six segments, ideology is the key driver of the variation that does exist. Conservatives' approval of Obama is in the single digits, regardless of religiosity, while 21% to 24% of moderate/liberals approve, with religiosity having little apparent impact on these attitudes. Religiosity is related to age, and the data show that the more a candidate narrows his or her focus down to highly religious and conservative Republicans, the more that candidate will be talking to an older audience. Ideology is also related to age, with conservatives significantly older than moderate/liberals. 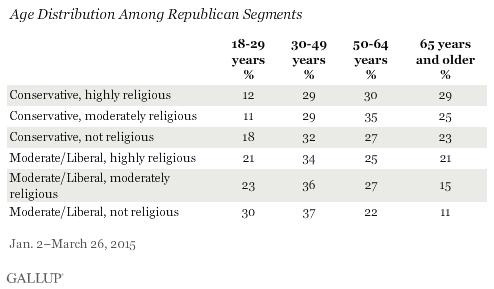 Thus, we see that 29% of the highly religious conservative segment is 65 years or older, while only 12% are under 30. Among nonreligious moderate/liberal Republicans, on the other hand, 30% are in the younger group with only 11% in the older group. This older skew among those who are highly religious and conservative can be a positive for candidates targeting these groups, since older voters are almost always going to be more highly represented among actual voters than their underlying proportion of the population would suggest. I've been talking here about the distribution of these variables within the Republican population, given that any potential Republican nominee has to first win his or her party's nod before moving onto the national stage. 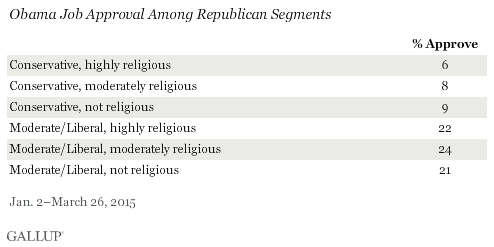 But we do know that outside of the Republican Party, the highly religious, conservative segment is very small. As one example, only 6% of all non-Hispanic whites -- the clearest target for a Republican candidate -- who do not identify with or lean toward the Republican Party are conservative and highly religious. This underscores the primary to general election pivot problem that will face any Republican nominee. A candidate like Cruz might dream of winning the nomination by motivating a core group of highly religious conservatives in the primaries, but he is not going to have many more of that species to appeal to when it comes to the general election. Cruz has pointed out that the last two Republican candidates who were more moderate to begin with lost the general election (that would be Mitt Romney and John McCain). He assumes this means a more conservative (and presumably more religious) Republican candidate might have a better chance in the general election, although the validity of that prediction is difficult to document. Republican Sen. Ted Cruz, the 44-year-old Canadian-born Texan who is now just in his third year as a U.S. senator, announced today during a speech at Liberty University in Virginia that he is running for his party's nomination for president. President Obama's job approval rating is down in recent weeks, although not dramatically. The American people gave their elected executive officer an average 42% rating throughout the month of June, which was down from 44% the previous two months (April and May), but then quite close to the 42% in February and the 41% rating Americans gave him in January. In other words, from a big picture perspective, Obama has been operating in a quite constricted zone in the lower 40% range all year. The selection of Pope Francis as the Person of the Year by TIME magazine has brought our attention to the Catholic church, its leadership, and its relevance to the world. One of the key factors that prompted TIME's editors to select Pope Francis was his outspokenness in pushing to make his Catholic religion more connected to the real world. This includes his encouraging Catholic leaders to expand their horizons beyond a sole focus on values issues, such as birth control and abortion, and his recent encyclical in which he focused on religion's relevance in ameliorating the problems of inequality and the poor in society today.